As I am updating the Roadmap to ABA Parent Training, Prompts, I wanted to provide more information about prompt hierarchies. Interestingly enough, there are many prompt hierarchies, and they’re all different. Training parents on prompt hierarchies can become confusing because there are so many prompts to choose from, and each prompt has to be faded out. 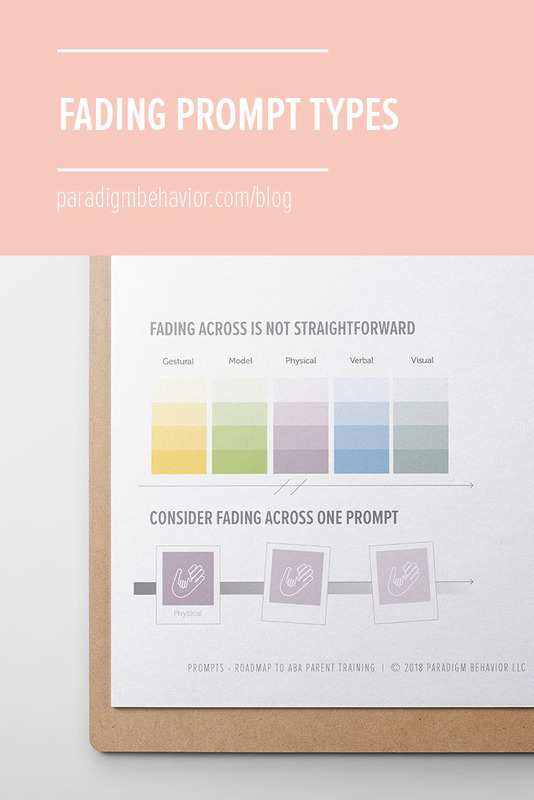 Below is an illustration showing fading across prompt types. It is difficult to compare because they are simply different. In a recent presentation by Dr. Andy Bondy (2017), he challenges trainers to pick just ONE prompt type and fade within that prompt. In the Parent Guide, prompt fading is emphasized so the learner can do the task themselves without the support of prompts. The process of fading depends on the prompt procedure (e.g. least-to-most, most-to-least, etc.) the trainer chooses based on what best fits the learner and the task they are teaching. By choosing one prompt type and fading within the prompt, the trainer has one prompt to fade vs. fading 2-3 prompt types. It is easier to think of prompt hierarchies this way because we’re not trying to compare “apples to oranges” or across color gradients, as illustrated above. It’s also a simpler approach to teach parents during their parent training sessions. I’m excited to share the new updates that are coming to the Prompts Roadmap to ABA Parent Training. I’ve added new visuals and examples to the Parent Guide like the ones you see above. Already have Prompts? Well, good news! You’ll receive a notification to download the updates for free when they’re ready.